Ten Hut! Ultra-rounded and super wide, the Shellshock in size Small stands 6” tall with a hefty 9.11” girth. 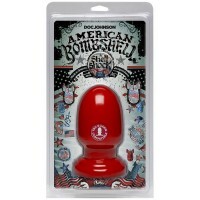 This American Bombshell offers a flat base for heavy action, perfect for rigorous solo play or with your favorite solider! Made of stunning Cherry Bomb PVC, this toy is phthalate-free, and body safe. Proudly Made in America.